"White Wine and Tails" is the latest offering from Will Bullas’s “2007 Food and Wine” series. The successful series is a playful tribute to the world of fine wine and the characters that inhabit it and has included such favorites as "Crabernet." 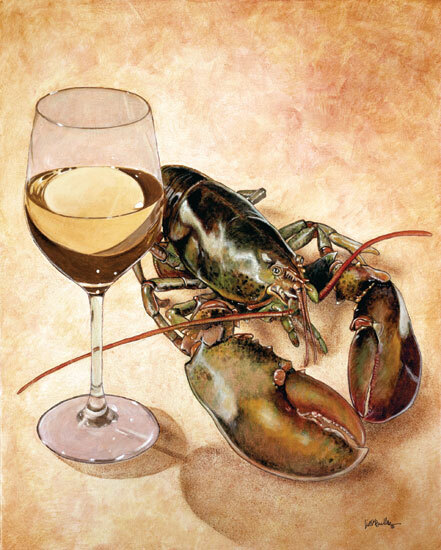 Bullas was inspired to paint "White Wine and Tails" while watching Fred Astaire and Ginger Rogers waxing eloquent on the subject of “white tie and tails.” Eager to include his favorite food in a painting, Will and his wife “got some lobsters and posed one of them in the studio.” Was it hard to paint a lobster? “He was easy to work with,” says Will of his lobster model. “And then,” recalls Bullas’s wife Claudia, “we ate him.” The smirk of this tipsy crustacean, forever preserved, makes "White Wine and Tails" a delightful addition to any wine cellar, kitchen, or office.